Ever since the 9/11 attacks, the Pentagon budget has been supplemented by funding packages earmarked to support the operations in Iraq and Afghanistan. Towards the end of the Bush administration, these supplements were called the Global War on Terror fund. When Barack Obama assumed office in 2009, this fund was renamed as Overseas Contingency Operations (OCO). President Obama’s proposed budget for FY2016 allocates $534 billion to the base account and $51 billion to the OCO budget. The president’s baseline spending account is approximately $35 billion over the spending cuts known as sequestration. The 2011 Budget Control Act set a cap on defense spending, which, after a deal in 2013 between Representative Paul Ryan (R-WI) and Senator Patty Murray (D-WA) that raised the caps, was set at around $499 billion. This cap, however, applies only to the baseline account and not to OCO budget because the latter is considered emergency funding. By allocating baseline spending above the caps, President Obama hoped to force Congress to act to end sequestration or, at the very least, point out the ineffectiveness of the caps. However, an end to sequestering defense spending would likely also require Congress to increase funding for domestic priorities and not just defense. House Republicans, unwilling to pick up the fight over sequestration but mindful of the military’s requests, cut the Pentagon’s baseline spending by around $36 billion and shifted most of that money to the OCO account. This way, it was able to meet the Pentagon’s funding request while also adhering to the cap on baseline defense spending. Increasing the OCO account to include budget items that are not strictly for supporting ongoing military operations has proven to be a highly controversial tactic. In the House budget, funding for two drone-related construction projects—an airfield in Agadez, Niger for Predator and Reaper drones and facilities in Sicily, Italy for Triton drones—were shifted from base spending to the OCO. Of course, not all of Congress’ departures from the president’s proposed budget are as inflammatory as the OCO. Both the Senate and House bills set aside funding for more drones, new research initiatives, and more training for drone new pilots and operators than was initially allocated in the president’s budget. Moving forward, the House and Senate will continue to debate these funding requests, and will eventually have to reconcile their differences on defense spending before sending the final version of the budget to President Obama. The president’s FY16 budget includes funding for the construction of new hangars and airfields at U.S. bases around the world to support drone operations. Among these projects are two budget items that the House Armed Services Committee moved from the baseline account to the OCO budget. The Senate, in its version of the defense spending bill, did not move these projects into the OCO, keeping them in their respective base budgets. Providing that the Senate passes S.1736, it will have to reconcile this issue with the House budget. Although these two projects amount to a fraction of the total amount of money that was moved into the OCO, they are representative of the effort by House Republicans to bulk up the OCO and the disagreements that have emerged within Congress over the separation of funds within the defense budget. The Air Force allocated $50 million for the construction of an airfield in Agadez, Niger that would provide a basing for American reconnaissance and surveillance drones—MQ-1 Predators and MQ-9 Reapers—that have been tasked to cover East Africa and the Sahara. The Navy has asked for $40 million to build new facilities for U.S. Triton drones at the Naval Air Station Sigonella in Sicily, Italy. This project involves building new hangars for the Triton and a mission control facility. The Triton will join the Air Force’s Global Hawk drones at NAS Sigonella when the project is completed by or before 2019. The Senate added funding for other drone-related construction projects that are not included in the president’s proposed budget. The Senate Armed Services Committee added $6.8 to build new facilities for Tactical Unmanned Aircraft Systems at Fort Stewart, an Air National Guard base in Georgia. Sen. Martin Heinrich (D-NM) pushed to amend S.1736 to include $3.2 million for the construction of Fixed Ground Stations at New Mexico’s Holloman Air Force base in order to accommodate more drone missions. The proposed budgets of the Air Force, Navy, and Army all include requests for new drones. By and large, the House and Senate spending bills provide funding for more drones that were requested. The House bill includes $65 million for one more Northrop Grumman MQ-4C Triton for the Navy. The Triton, the Navy’s version of the Air Force’s RQ-4 Global Hawk, is a long-distance, long-endurance reconnaissance and surveillance drone. The Pentagon’s proposed budget included a request for three Tritons; the House addition raises the total for the Tritons from $494 million to $559 million, plus advance procurement costs. The Senate bill does not include this addition. The House bill allocates $36 million for an additional three Northrop Grumman MQ-8 Fire Scouts for the Navy for a total of five of the unmanned helicopters. With the three new Fire Scouts, the funding for this platform increases from $120 million to $156 million. The Senate bill does not include this addition. The House bill includes $15.2 million for an additional General Atomics MQ-9 Reaper for U.S. Special Operations forces. (The request is located in the Defense-wide spending section.) This additional drone raises the total from $11.7 million to $26.9 million for MQ-9 drones for special operations. While the Senate bill does not include this addition, it does add $10 million for MQ-9 capability enhancements to the Pentagon’s request, bringing the total to $21.7 million. The House bill provides an additional $17 million to improve the endurance on existing MQ-1C Gray Eagles, the Army’s version of the Predator drone. This brings the total amount for the MQ-1C allocation to $293.9 million. The Senate bill does not include this addition. The Senate bill allocates $480 million to the Air Force for an additional 24 MQ-9 Reapers. The president’s budget proposal already includes funding for 29 new Reapers at $566 million. If passed, the new allocation by the Senate would nearly double this request for a grand total of $1,032 billion. According to the report by the Senate Armed Services Committee on S.1376, this increase is necessary to meet the demand from combatant commanders. The House bill does not include this addition. On May 14, 2015, the Government Accountability Office released a report that highlighted deficiencies in the Army and the Air Force’s training program for drone pilots and operators. The GAO found that the demands for drone crews were not only outpacing the supply of ready service members, but were affecting the quantity and quality of training that drone crews receive. In a letter published on May 27, Senators John McCain (R-AZ) and Jack Reed (D-RI) urged Secretary of Defense Ashton Carter to improve the Pentagon’s training program for drone crews. “We are disturbed that the Department of Defense has no standardized training program for UAS pilots and personnel,” write McCain and Reed. Both the House and Senate defense spending bills contain additional funds specifically for overhauling this training that are not included in the president’s proposed budget. The Senate bill adds $43 million to the Air Force’s Specialized Skill Training fund, designating the funds for improving the readiness of drone crews. To the Army, while the Senate has also increased its Specialized Skill Training fund by $33 million for readiness improvements, this additional funding covers more than just training for the Army’s drone crews. The Senate also requires that the Secretary of the Air Force to submit a report on efforts to rectify personnel shortfalls. Perhaps in lieu of funding the UCLASS, the Senate bill includes $750 million in funding for researching and developing an Unmanned Combat Air System Demonstration (UCAS-D). The House bill does not contain this addition. The Senate bill adds $11 million to the Advanced Submarine System Development (Program Element 0603561N) project to accelerate research and development of unmanned undersea vehicles. The House bill does not contain this addition. In addition to allocating funds, substantial portions of these bills consist of notices or requests from Congress to the Pentagon. These notices might require that the Pentagon provide information on certain programs or emphasize research and development in a particular area. 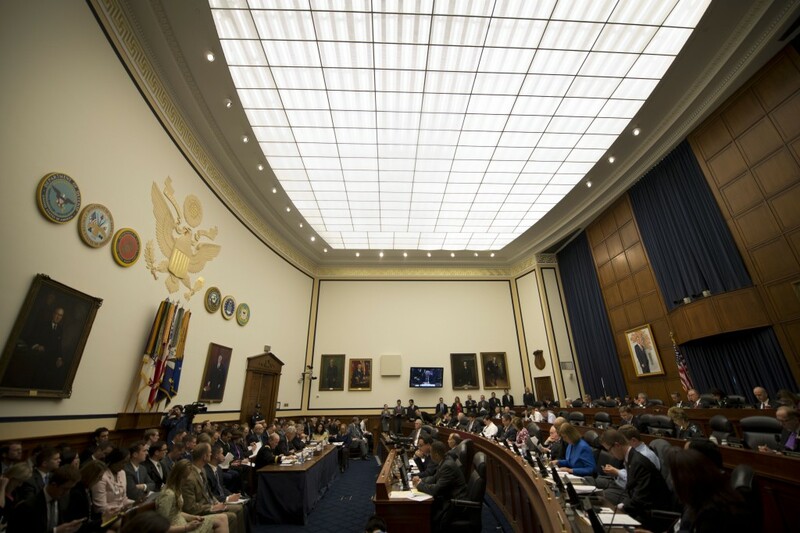 Individual amendments to the bills, as well as the reports from the House and Senate Armed Services Committees on each house’s respective spending bills, identify and explain many of these areas of interest. Senator John Hoeven (R-ND) submitted an amendment to H.R.1735 that would require the Pentagon to issue a report to Congress on the possibility of using the Air National Guard to operate and maintain the Air Force’s RQ-4 Global Hawk. The report would detail the costs, training requirements, and feasibility of employing Air National Guard soldiers to work alongside Air Force personnel on the RQ-4. (The North Dakota Air National Guard 178th Reconnaissance Unit already flies the MQ-1 Predator.) The amendment—S.A.1484—was agreed to by the Senate in a floor vote on Thursday, June 4.